We supported Orange Friday in Room 21! 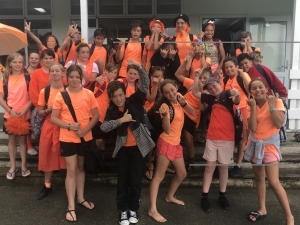 It was heaps of fun to dress up and show off our Nikau colours, as well as support a fantastic organisation that do a lot of good in our community. This was also the day we decided on our students leaders for 2018. We are proud to announce our team as follows: Class Representatives – Ryan Parkes and Holly Chapman, Deputy Representatives – Chenoa Jarrett and Kiahn Crewther, Sport Representatives – Leon Marshall-Chase and Mia Diamond. Kiahn and Mia also represent all KIS students as a part of the Student Council. We are excited to have a magnificent year where all our students shine, and show leadership in all kinds of ways. Congratulations to all our leaders, you are amazing! We would also like to thank all students who put their name forward, and those who took part in the selection process. Well done Ruma 21 nice class photo and I love the Kaupapa.